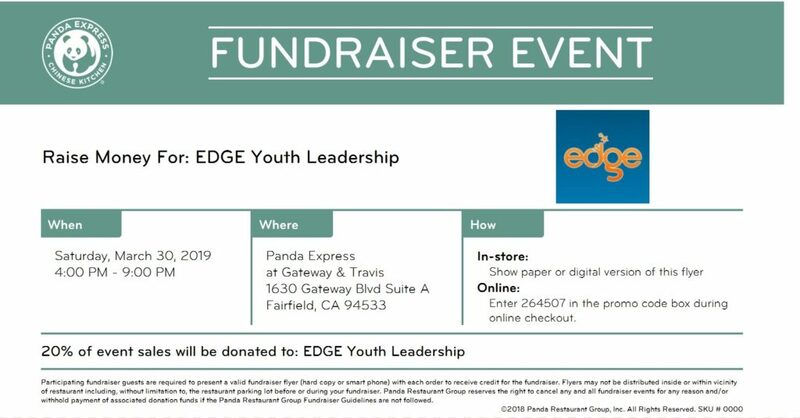 Friendly reminder that on *March 30* we’ll be having a fundraiser at Panda Express (1630 Gateway Blvd, Fairfield) from 4-9. 20% of *ALL* proceeds will be donated back to EDGE so come hungry and bring your family/friends! When you pay, you must present the attached flyer at the cashier, in order for a portion of your purchase to go towards EDGE. Present this flyer to the cashier when paying for order for a portion of your purchase to go towards EDGE! Fundraiser on March 30 from 4pm – 9pm at Panda Express in Fairfield!